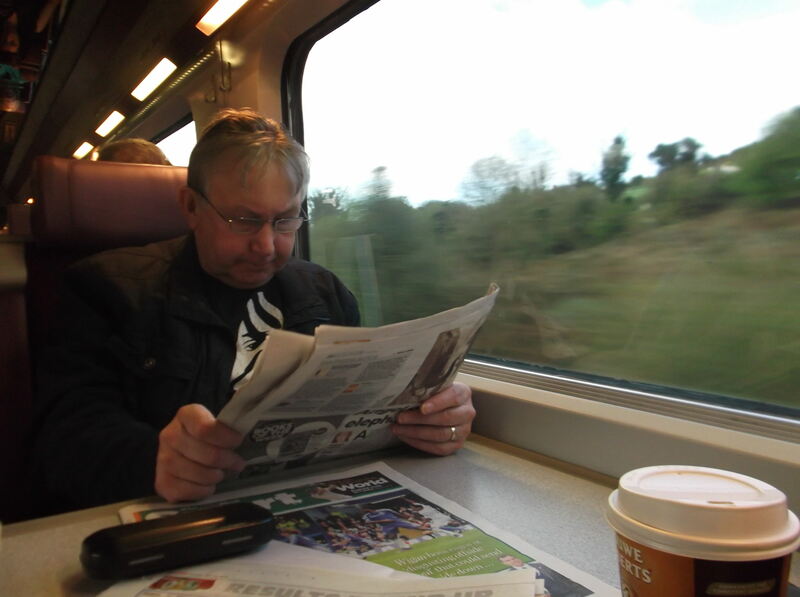 World Borders: How to get from Northern Ireland to Republic of Ireland on the Belfast to Dublin train. I’m sure a lot of you reading will be thinking “what do you mean a ‘border’ in Ireland?”, which is something I’ve surprised a load of people with on my travels. It still astounds me to this day that most people around the world don’t know there are two countries on the island of Ireland! As much as you’d wish to think it, Ireland is not “one big happy family”, in fact far from it. It consists of Northern Ireland (my country) and the Republic of Ireland. What? There’s a Border? Yes of course there is!! 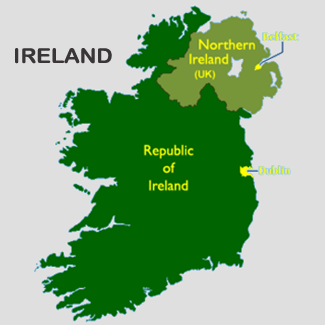 Northern Ireland and Republic of Ireland make up Ireland! 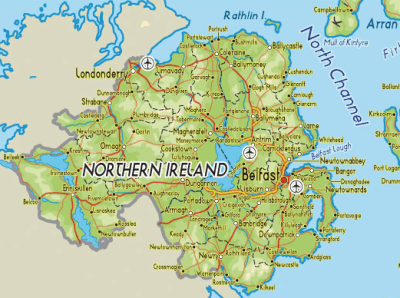 Since the formation of Northern Ireland in 1921, there has been a border between the Irish counties of Fermanagh, Antrim, Tyrone, Londonderry/Derry, Armagh and Down and the rest of the island. Those six counties form the country of Northern Ireland, one of four countries in the UK (along with Wales, Scotland and England). I come from Bangor in County Down, Northern Ireland. 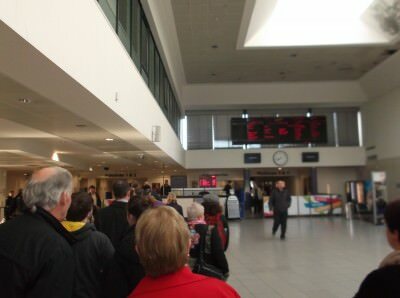 Boarding the Belfast to Dublin train in Belfast Central, Northern Ireland. 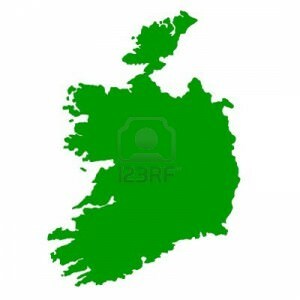 The green bit is the land mass in Ireland which belongs to the Republic of Ireland. While in the 1970s, 1980s and for most of the 1990s, the border was heavily manned by guards, that is most certainly not the case any more and you can freely cross between the two countries these days – there’s not even an obvious “border” though some derelict buildings of the old border control stations do exist. It’s an overland border and I don’t even think any sea crossings exist between Northern Ireland and the Republic of Ireland (if you know different, please let me know of a boat crossing border). You can cross it by car, by bus or by train. And even by foot. I’ve crossed the border a lot of times and in different ways. 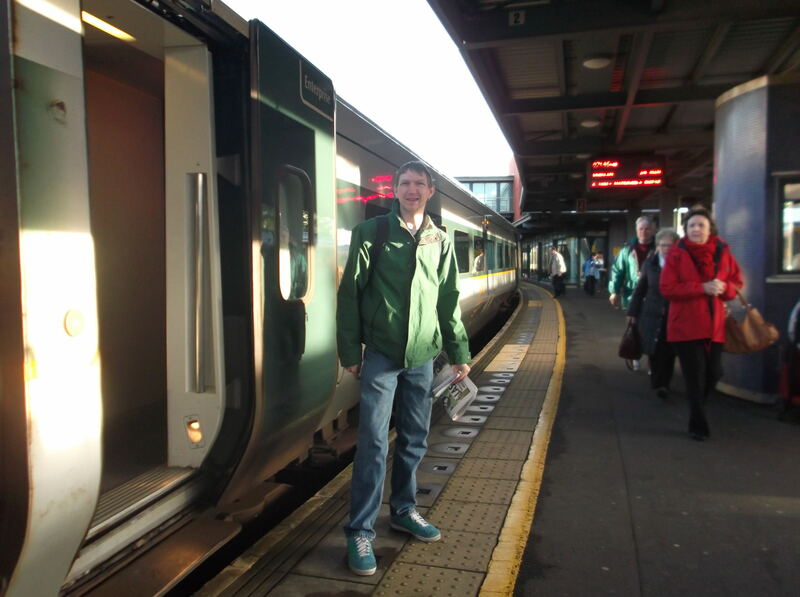 But today I’ll talk about the train – it’s a popular way to get from Belfast to Dublin in just over 2 hours. There can’t be many train rides in the world that take in two capital cities in 2 hours. Vienna to Bratislava for sure, can’t think of any others off the top of my head. 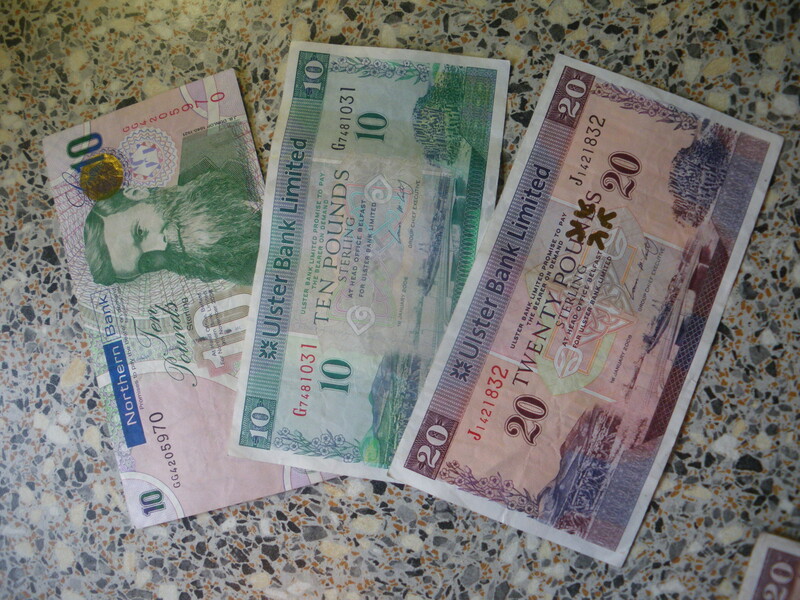 Northern Irish banknotes – British Sterling is used in “Norn Iron”. 1. Book it online in advance on the NI Railways Website and then print your receipt and pick up your ticket when you arrive at the station. 2. Book it in the train station (to be honest this route is not always full so you can get away with booking it just before you leave – but try to avoid rush hour as a lot of business types get on at the same time). The prices vary and keep your eye open for special offers on the website, they sometimes do cheap day returns. You can book your ticket there and then at Belfast Central station but you’ll have to queue. How much does the Belfast to Dublin train cost? – if you’re going from Belfast to Dublin, either use the NI Railways website or book at the station in Belfast – pay in £British pounds. – if you’re going from Dublin to Belfast, either use the Irish Railways website or book at the station in Dublin – pay in Euros. At Belfast Castle in Northern Ireland. 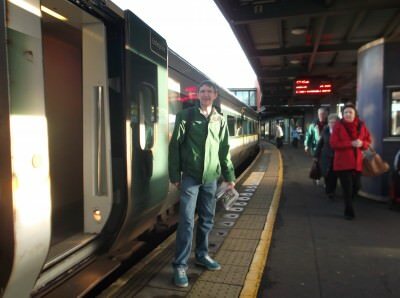 What Stations in Belfast can I board a train for Dublin? There are two main train stations in Belfast – Belfast Central (which isn’t really in central Belfast to be honest) and Great Victoria Street (which IS in central Belfast). 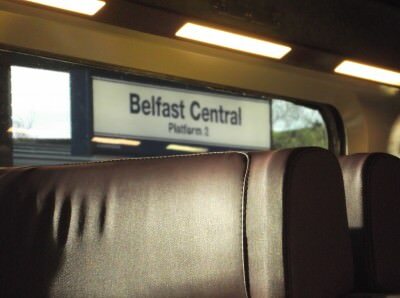 However the Belfast to Dublin train (known as The Enterprise) only leaves from Central Station in Belfast. At least at the moment. It’s a different company from the NI Railways, the Belfast to Dublin train is run by Enterprise. Belfast Central station – the departure point for the Belfast to Dublin cross border train. What stops are there on the Belfast to Dublin train? 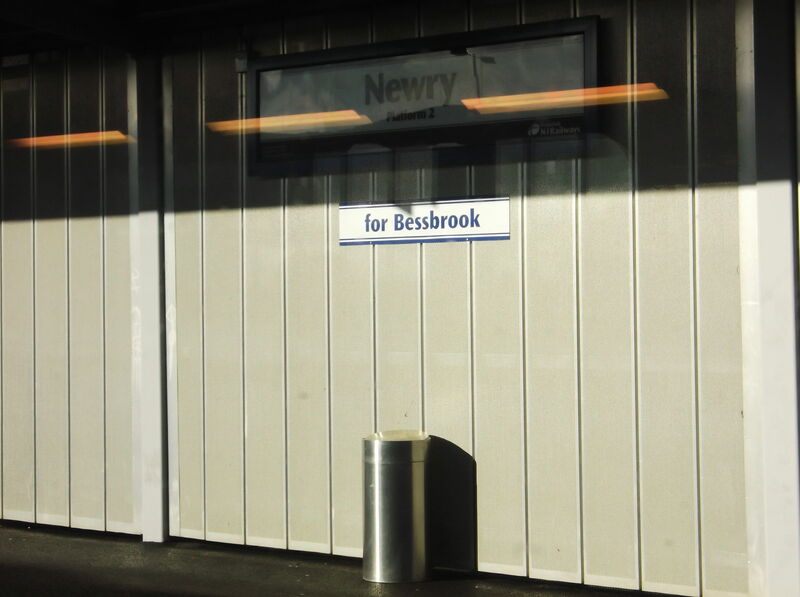 So if you merely wanted to “cross the border on the train” for cheap, you could do Newry to Dundalk. 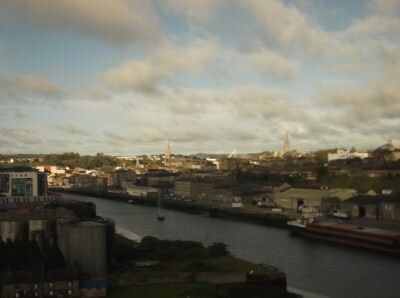 Newry: The last stop on the train in Northern Ireland before the border into the Republic of Ireland. How long does the Belfast to Dublin train take? Again this depends what time you go and any other issues that day. Currently the 8am train takes exactly 2 hours, arriving in Dublin at 10am. Not bad at all and a great journey. Most of them take between 2 hours to 2 hours 20 minutes. It’s a really nice train trip actually. It’s a fast train – in just over 2 hours you’ll arrive in central Dublin. What facilities are available on the Belfast to Dublin train? This is Ireland, so alcohol is allowed of course. 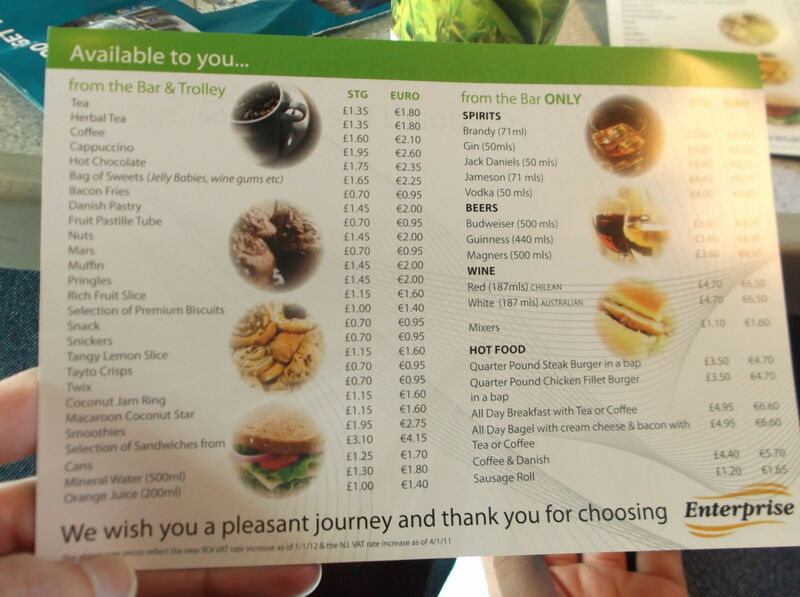 A trolley will go past serving anything you want from the menu. In terms of food, it’s things like sandwiches and croissants. 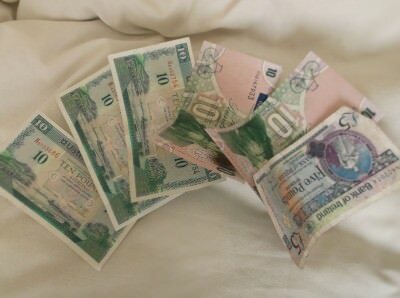 You can pay in either Euros or Sterling. The language used is English. 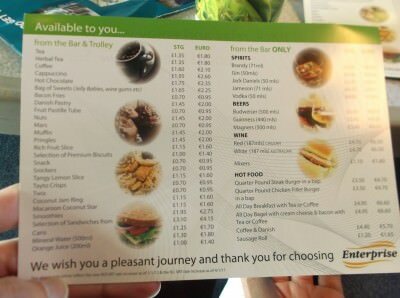 The menu onboard the Enterprise Belfast to Dublin train. How do you know you have crossed the border between Northern Ireland and the Republic of Ireland? These days it’s rather hard to tell. Once you leave Newry, you’re only a few minutes away from the Republic. Tell tale signs are the road signs out the window. They will be written in Irish Gaelic and English in the Republic of Ireland. In Northern Ireland they will be written in English only. Also the distances in the Republic of Ireland are listed in kilometres, while in Northern Ireland we use miles. 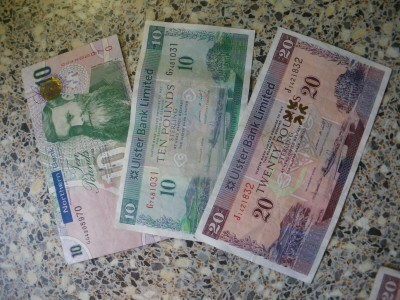 Apart from a slight accent change, currency change, you’d not really know what country of the two Irelands you were in. 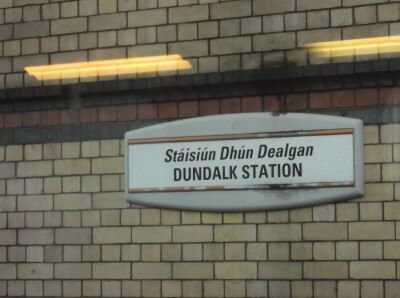 Arrival at Dundalk will confirm it for you – the station is in the Republic of Ireland and is written in both Irish Gaelic and English: Staisiun Dhun Dealgan/Dundalk Station. 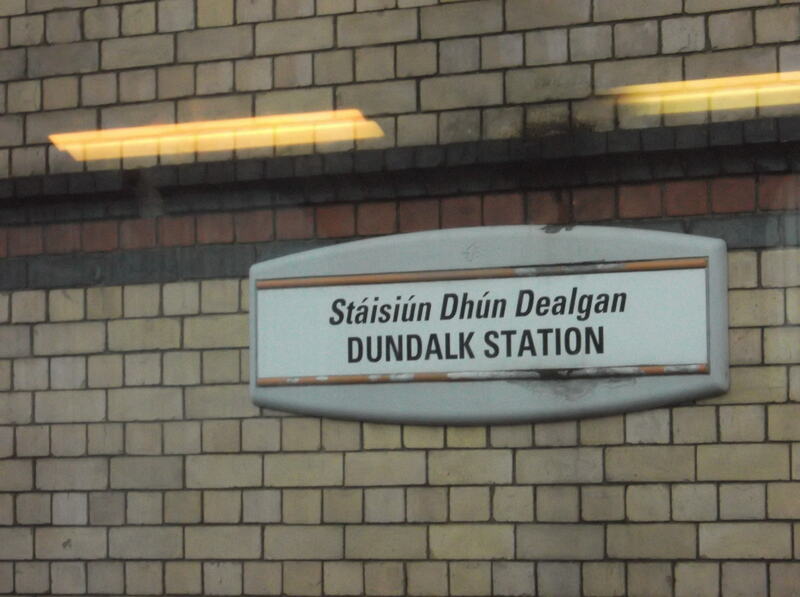 Arrival in the Republic of Ireland will be confirmed when you see Dundalk Station. Is the Belfast to Dublin train dangerous? I’ll be honest and tell you that this is one of the least dangerous trains I have ever been on. It’s safe to relax on board. Just be mindful of your possessions as usual, but theft is rare on these trains. On one of my journeys in the 90s the train was stopped and delayed due to a bomb alert. Thankfully, those days appear to have passed us by. Relax! Read a newspaper and have a coffee – the cross border train in Ireland is safe! 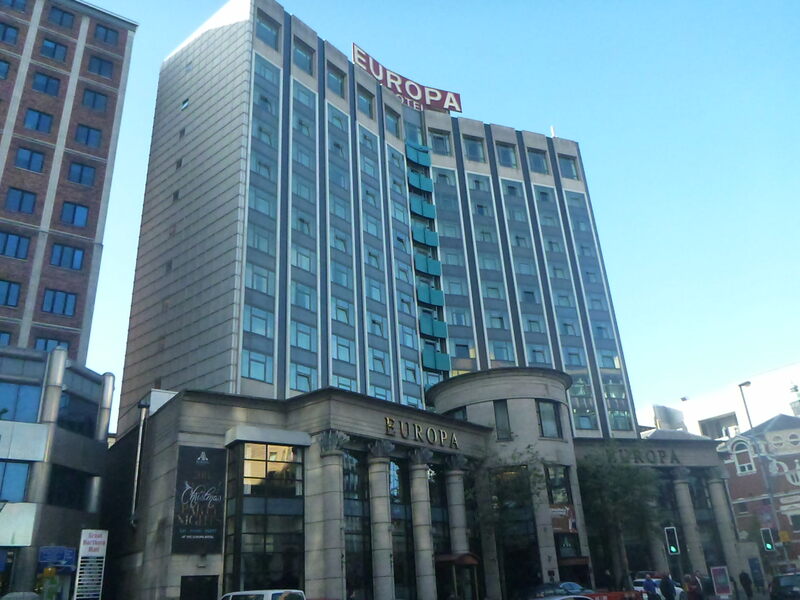 Sit back and enjoy the view and make sure you have Euros in advance for when you get off at Connolly Station in Dublin. 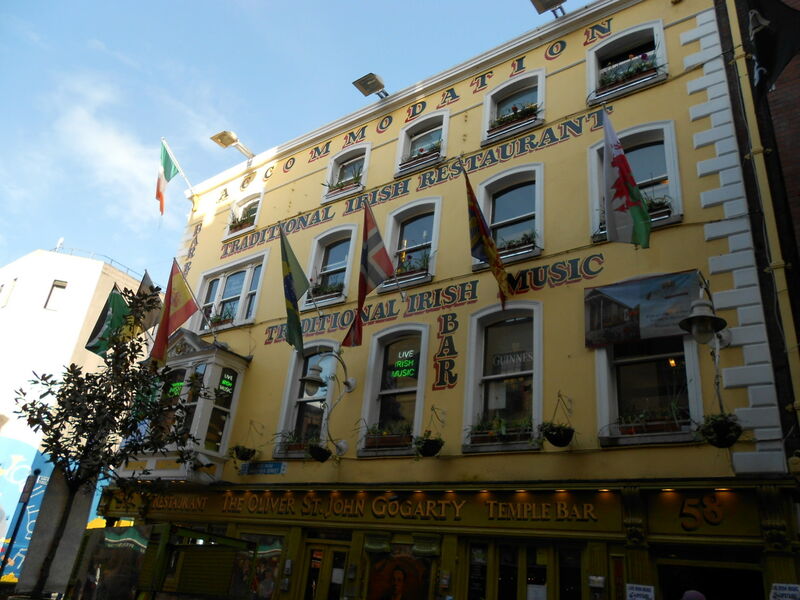 Whether it’s Northern Ireland or the Republic of Ireland you end up in, you will love it. Don’t forget your pint of Guinness. It’s more than just a stereotype…and when in Belfast make sure to visit the epic Titanic Museum, Windsor Park football stadium, the Oval Grounds, the Crown Bar and stay at either the most bombed hotel in the UK (the Europa) or the largest backpackers in Northern Ireland. So there you go – a world borders experience with a bit of geography and history thrown in. It’s the same island, but ultimately there are two separately governed countries on it. Safe travels my friends! 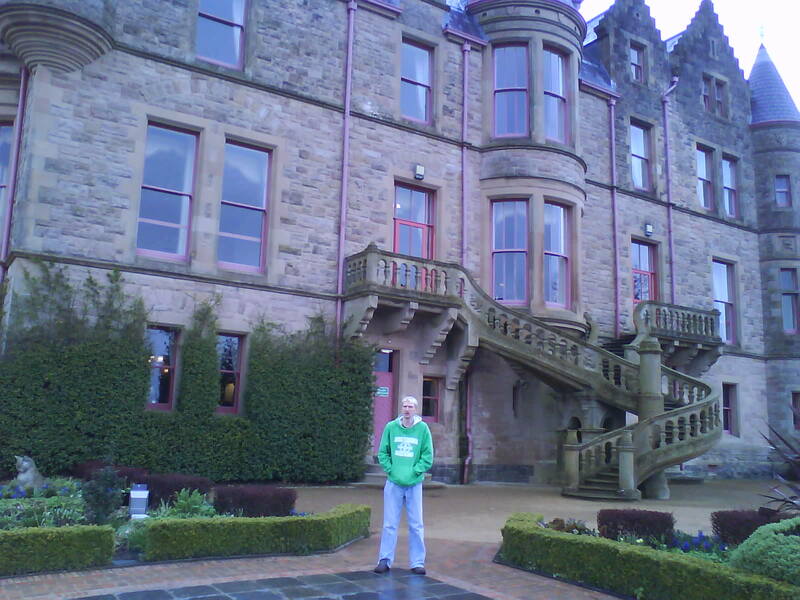 This entry was posted in Belfast, Destinations, Dublin, Europe, Northern Ireland, Republic of Ireland, Trains, Transport, World Borders. Bookmark the permalink. I enjoyed this post because it’s a topic I rarely consider. They are two separate governments although they share the island and a history. My family hails from the south, down around Cork and Innishannon. I’ve been there but haven’t seen/experienced Northern Ireland – you make me want to go, see, experience. Thnx. 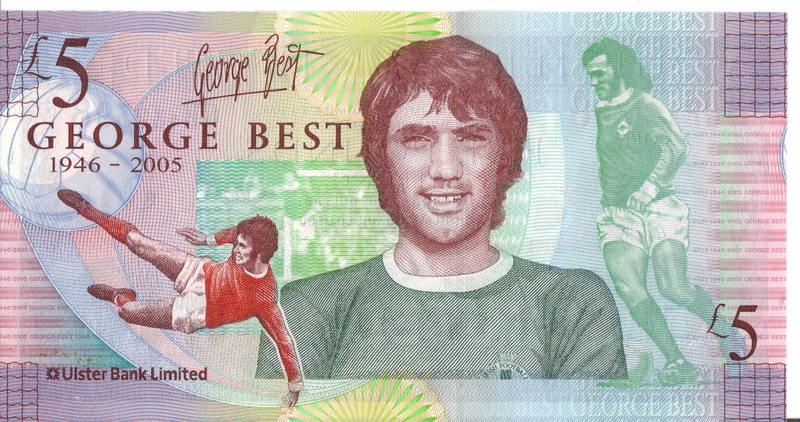 Hi Jonny, Just wondering if I could use your pictures of the Northern Irish banknotes to go alongside an article I am writing for BBC News Scotland about connections between Scotland and Northern Ireland. You would be appropriately credited.